This classic Christmas dessert is a tradition in France. Evidently Napoleon believed cold air caused illnesses and ordered that all chimneys in Paris be closed in the winter. 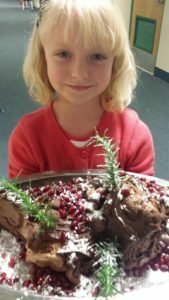 This eliminated the french tradition of gathering around an actual Yule Log on Christmas Eve, so in classic French fashion they developed a culinary confection to solve this problem and the tasty cake version of a piece of wood was invented. These are a lot of fun to make, especially if you have some younger helpers to make the mushrooms. Though traditionally the mushrooms are made of meringue, this new and very simple technique it really fun to make. I like to also garnish the cake with fresh holly leaves. If you choose to use holly, avoid using any holly berries, they are slightly toxic. 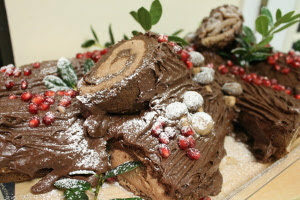 Instead, try using pomegranate arils for ruby red berries around the log. Preheat oven to 375ºF. Line a 17”x12”x1” baking pan with parchment and spray with non-stick cooking spray. Beat the egg yolks with ½ cup sugar until pale and thick. Add vanilla, coffee, and cocoa; mix thoroughly. In a separate bowl, beat salt and egg whites until peaks form; gradually add remaining ¼ cup sugar and whip until stiff peaks. Fold yolk mixture into the white mixture then spread evenly into prepared pan. Bake 13 minutes or until springy in middle. When cake is done, remove from oven and allow to cool on cooling rack at room temperature for five minutes. Cut around edges of cake and invert cake onto another (large) sheet of parchment paper that has been dusted with powdered sugar. Carefully remove parchment from the bottom of the cake then roll up lengthwise with the sugar dusted paper for support. Allow to continue to cool (with paper in it) 30 minutes on cooling rack. Gently unroll the cake, spread top with the filling, and re-roll without the paper. Place in refrigerator and allow to chill for at least an hour. Then, cut both ends at slight angles and use some of the frosting to glue the cut pieces against the cake (one sticking straight up and one to the side...they should look like broken branches). Cover areas of the cake that need bark with a generous layer of chocolate frosting. Score frosting with a fork to simulate the texture of bark. Dissolve coffee in vanilla. In a large bowl, combine all ingredients and whip in a large bowl until stiff and thick. Refrigerate until ready to frost cake. Dissolve coffee in vanilla. Melt butter, stir in cocoa. Add the powdered sugar and milk, beating on medium speed to spreading consistency. Add more milk if necessary. Stir in vanilla. To garnish, make mushrooms by cutting the points off of Hershey’s kisses then using a little frosting to attach a small marshmallows to the bottom. Brush the marshmallow with cocoa powder so it looks brown. Strategically place “mushrooms” on and around the log. Also use fresh holly leaves and pomegranate arils. Give a light dusting of snow to the whole creation with powdered sugar when you are finished.